I always have wondered about that small surface in the trailing edge of the elevator, at the beginning, I thought it's for stabilizer trimming, but later on, it dawned on me that it was made for another purpose, and it's called balance tabs. 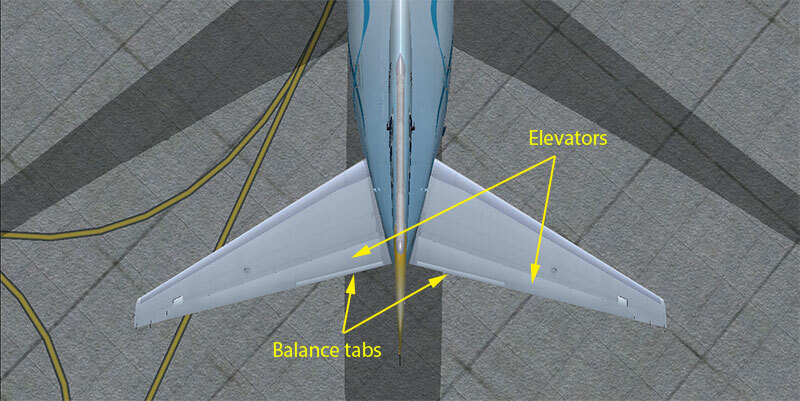 Balance tabs was made to assist in moving the elevator, so the loads on the control column (Yoke) are significantly reduced, which makes the airplane easier to fly. This action creates a small aerodynamic force, which acts in the opposite direction to the main aerodynamic force created by the elevator, and this results in a reduction in control effectiveness, as the tab force is opposite to the control force. So now maybe you're thinking why somebody wants to reduce the control forces required to move the elevator, in fact, it's very effective in critical situations such as hydraulic systems failure, because it will help the pilot for better manual controlling, since it will reduce the loads applied on the control column.